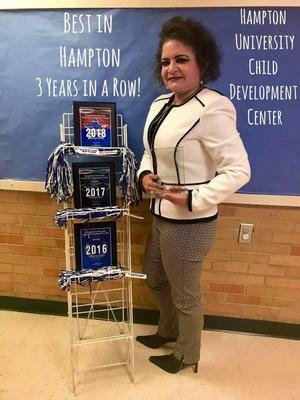 HAMPTON, Va. (February 5, 2019) – The Hampton University Child Development Center’s Director, Mrs. Joy L. Phelps, will be the recipient of the 2019 Robert O. Bigelow Award, on May 9, 2019. This award is presented to a Hampton Roads Community Action Program (HRCAP) volunteer that best exemplifies the spirit of Lt. Col. Robert O. Bigelow and shares his passion in meeting the needs of the Hampton Roads community. “Mrs. Phelps has and continues to provide excellent work for the Hampton University Child Development Center. We take great pride in seeing our faculty receive great honors. We look forward to the continued success of the Child Development Center under the leadership of Mrs. Phelps,” said Hampton University President, Dr. William R. Harvey. Phelps has worked in the Early Childhood Education field for more than twenty-four years. As the current Director of the Hampton University Child Development Center, this center has been recognized as the Best of Hampton 2016, 2017 & 2018, Childcare Category; and the June 2017 Provider Award from Child Care Aware of America. Phelps is no stranger to receiving awards, as she was a 2017 Darden Fellow Awardee from the Darden College of Education of Old Dominion University and inducted into the Darden Fellows Hall of Fame. Since 1966, Hampton Roads Community Action Program has been involved in the struggle to eliminate poverty by providing a variety of programs and services to the citizens of the cities of Newport News and Hampton, enabling them to achieve self-sufficiency. As a volunteer, Phelps is a part of a sub-group called, Project Discovery. This unit of HRCAP provides opportunities for students in sixth grade through twelfth grade with opportunities to go to college through various workshops, college tours, and fundraisers. “I started as a regular volunteer with Project Discovery. Later, they made me one of the co-chairs. Now, I’ve been doing this for three years. I’ve helped so much with sponsors and putting the word out to have people attend events. It pays off. It’s for a good cause. I’m a person who’s huge on education. I think every person should have the right to have an education. We encourage our youth to continue on to receive their degree while providing the resources they need,” said Director of the Hampton University Child Development Center, Joy L. Phelps. Phelps will be awarded the 2019 Robert O. Bigelow Award on May 9, 2019. The presentation will take place at the 2019 HRCAP Community Builder Awards Dinner at the Marriott at City Center in Newport News, Virginia.